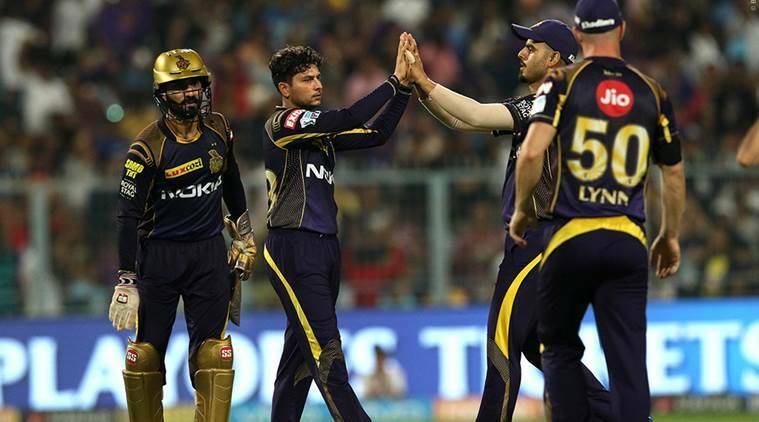 Two-time champions Kolkata Knight Riders will relish home advantage when it takes on a struggling Sunrisers Hyderabad in Qualifier 2 of the ongoing Indian Premier League, said the team’s left-arm wrist spinner Kuldeep Yadav. KKR are lucky to play the two knock-out playoff matches at the Eden Gardens. The two-time champions ousted Rajasthan Royals last night here en route to its fourth win on the trot. Next up is Sunrisers Hyderabad, who have lost four matches in a row — the latest defeat coming against Chennai Super Kings in the Qualifier 1 in Mumbai — and the visitors will have to quickly adjust to the conditions at Eden Gardens to stop KKR from entering its third IPL final. “Obviously it will be difficult for them (Sunrisers) to come from Mumbai and play here. Mumbai wicket has true bounce whereas the Eden track aids spin. It’s our home ground, so it’s very easy for us to play here,” Kuldeep, who returned with a tidy 1/18 from his four overs, said after KKR’s win last night. KKR, however, are not underestimating Sunrisers, whose performance has been on the wane after topping the table in the league stages. “We are not looking at the results. It does not matter whether they lost four in a row or we won four. Winning our next match is the priority at the moment,” Kuldeep said. “It’s knock-out stage. Every game is very important from here on. They are a very good side and we are up for a good contest.” Kuldeep provided the crucial breakthrough last night to dismiss Ajinkya Rahane for the second time in three matches this season as Rajasthan choked from being 109 for 1 in 14 overs to be restricted to 144 for 4 in pursuit of 170. The collapse began right after the second strategic timeout and Kuldeep said they executed their plan perfectly in breaking Rahane’s 82-run partnership with Sanju Samson, who hit a 50. “They were going well and the discussion at the timeout was to break the partnership. We were looking for wickets. Later on PC bhai (Piyush Chawla) got Samson and took the game away from them,” he said. Kuldeep and Chawla stood up and delivered for KKR last night as Sunil Narine had a lean day. “We were playing with three spinners and sometimes your best bowler goes trough bad patches. Myself and PC had to stand up for him and we did well,” Kuldeep said. “I’m bowling just normal, focusing on basics and backing my strengths. In this format, if you try much you can go for runs.” Kuldeep also praised Andre Russell for his man-of-the-match performance. Russel hit unbeaten 49 from 25 balls to prop up KRR’s total. “It was an extraordinary innings. He also bowled well at the death and deserved the award,” he said about Russell, who gave away just 22 runs from his three overs.